Even for a renowned outlet like Art Lebedev Studios, it's hard to get quirky, design-centric products out in a commercialized, race-to-the-bottom world. Far too often, dreams die at the production line, and some of the best designed gear in the world stalls on the drawing board. Somehow or another, Sherwood Forlee and Mihoko Ouchi have managed to overcome the traditional production limitations and bring this particular fantasy to life. If you'll recall, we heard about The. 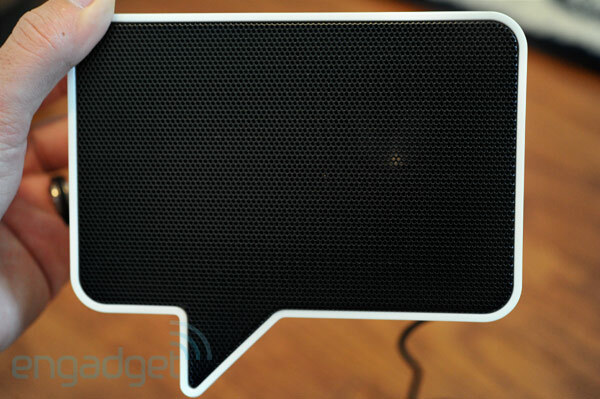 's Speak-er back in January of this year, and while we knew plans were in place to start shipping 'em to end-users before the dawn of 2011, we maintained a healthy level of skepticism -- there's nothing quite as heart-wrenching as having your bubble burst after ratcheting your hopes up too high, you know? Today, we're thrilled to say that the Speak-er is now shipping to those with $99.95 to spare, and if you care to hear what we think about the most awesome set of desk speakers this planet has ever known, head right on past the break. 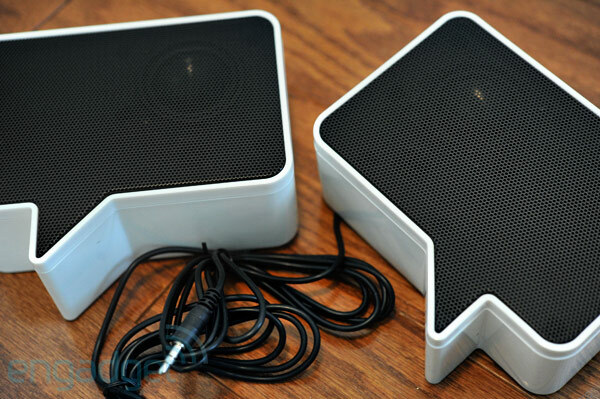 For all intents and purposes, the Speak-er set is a rather elementary pair of desk speakers. There's a volume knob on the rear, an AC power input, and a 3.5mm audio input. This enables it to play nice with any audio source with a 3.5mm output, which is just about everything from a Nexus One to a Latitude D410 from a decade ago. We'd heard earlier that they'd be priced at $120 a pair, but right now, a Benjamin will get a pair shipped straight to your door -- or straight to the stocking of your Secret Santa, now that we think about it. There's no bass or treble controls, so any equalizing you do has to be done at the source. We tested these out on our own desk, and found the highs and mids to be shockingly accurate and lifelike, though the lows were predictably lacking. That's not to say there wasn't any bass (read: there was! ), but pushing the volume knob past the 60 percent mark generally led to muddled lows. Frankly, that's exactly what we expected from a set of 2.0 speakers with no dedicated subwoofer, but our expectations were exceeded when listening to the mids and highs. If you plan on keeping these on your workspace while maintaining a relatively sane, low volume level, they'll definitely do the trick. And they'll look way, way better than any other set of speakers you'll find for $100.